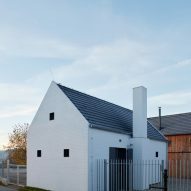 Architecture studio ADR has added this gabled fruit distillery to a farm in the Czech Republic, featuring white-painted brick walls, small square windows and a black spiral staircase. 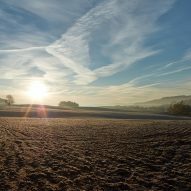 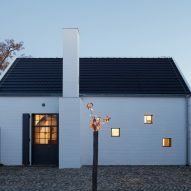 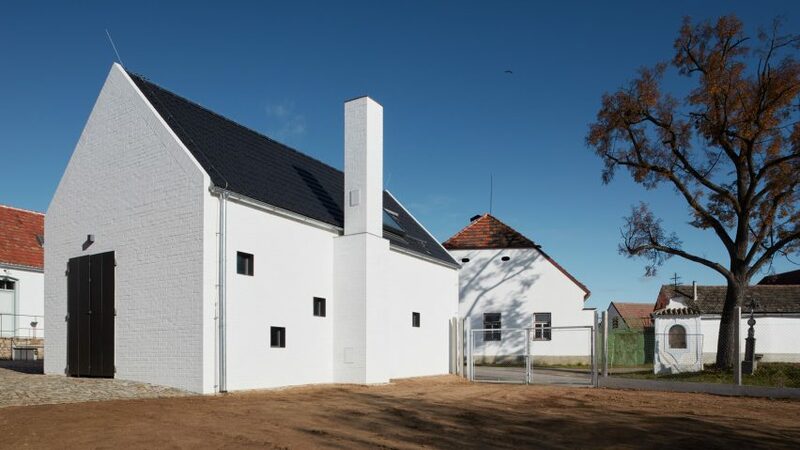 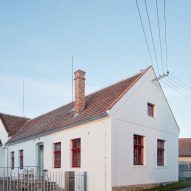 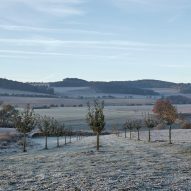 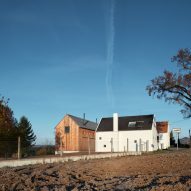 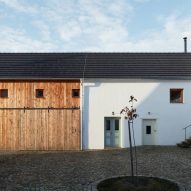 The architects added the detached distillery to the outbuildings of the farm located near an apple orchard in Javornice – a village in South Bohemia – creating a partially enclosed and protected courtyard between. 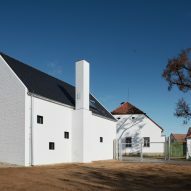 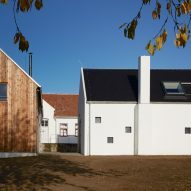 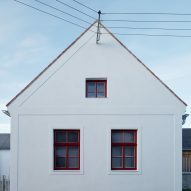 The gabled design and black roof tiling are intended to blend in with the local architectural vernacular, but the architects chose to use the white-painted brick walls to mark its significance. 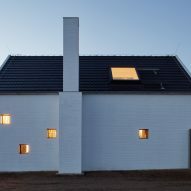 "From afar, on arrival to Javornice, it is not apparent at first glance that it is a new building, on a closer and more detailed examination, however, it is quite obvious," the architects explained. 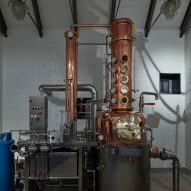 "So the distillery has become a natural part of the village." 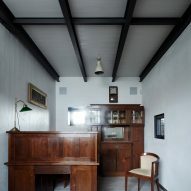 Inside the building, black-painted roof beams contrast the exposed white-painted brickwork walls and roof panelling, while the walls are punctured with irregularly place small square windows. 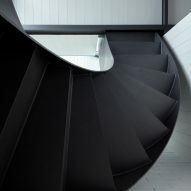 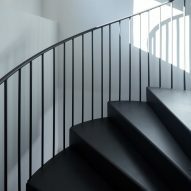 A spiral black steel staircase leads up to a guest bedroom located in one half side of the attic. 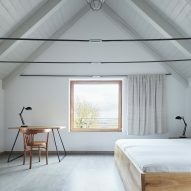 It features a built-in bed and a small wooden study desk placed underneath a large skylight. 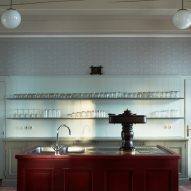 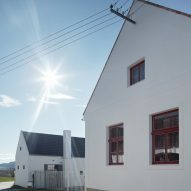 The architects also renovated and refurbished the existing buildings to include all the necessary facilities for the Javornice distillery. 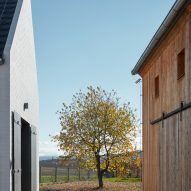 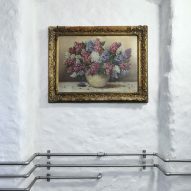 Amenities now include a shop, a fruit store, a refrigerated fermentation plant, a garage, as well as accommodation for the residents and guests, and a pub with a large dance hall. 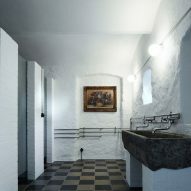 For the restoration, the aim was to preserve as much of the original architectural features. 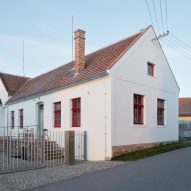 Where this was not possible, the architects sought to use similar characteristics to the surrounding South Bohemian style. 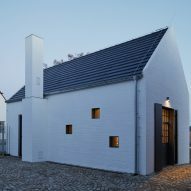 "Proposal of the buildings, the facades and shape of the roof, were significantly influenced by the immediate environment, and thus traditional solutions to both shape and material have been used," said the architects. 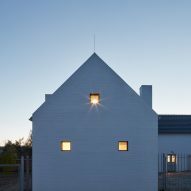 "For new buildings, we chose new materials, contemporary but with respect for the original buildings." 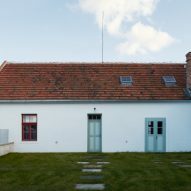 Traditional red roof tiles feature in the original buildings, while replacement structures are denoted by black roofing. 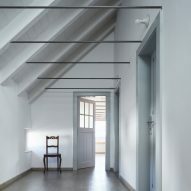 Most of the walls are covered in traditional lime plaster, but new wooden structures are clad in timber panelling. 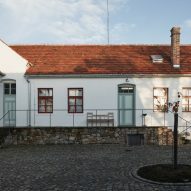 The courtyard areas, porch and other spaces around the buildings are paved with natural stone. 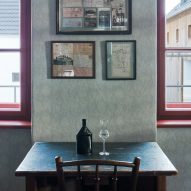 More traditional finishes feature in the pub and dance hall, including decorative wallpaper and red-painted window frames. 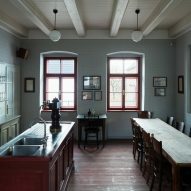 Green wooden boards line the walls in the bar and dining area, while furnishings are in a darker wood. 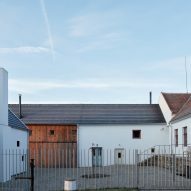 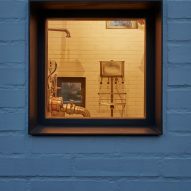 Similar to the Javorník distillery, other facilities for manufacturing spirits include one in Mexico that can host tequila-fuelled parties and an east London liqueur workshop.